Metromony - which ring suits your lifestyle? We feature in the latest Metrosouce magazine! (Click on the image to see the whole article). Metrosource is a leading New York magazine for LGBT people. 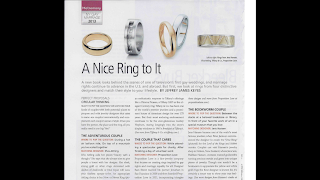 We're very pleased to be part of this column about choosing wedding rings that match your lifestyle.